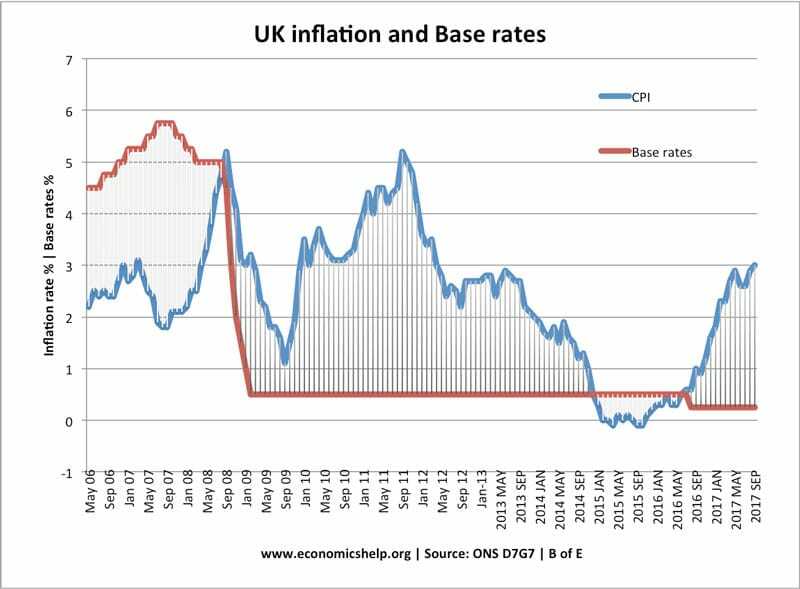 Home > Economics help blog > economics > Does low inflation always mean low interest rates? Does low inflation always mean low interest rates? Readers Question: Does low inflation always mean low-interest rates? Yes, Generally low inflation will lead to low-interest rates. Although in practice there may be some divergence. The UK has an inflation target of CPI = 2%. Therefore, interest rates are used to achieve this target. If inflation falls to below 2% the MPC will cut rates to maintain economic growth. There is no need for high-interest rates when inflationary pressures are low. For example: If you had an inflation rate of 1% and interest rates of 7%. There are a very high real interest rates (7-1 = 6%) Therefore, this would encourage saving and discourage borrowing and spending. This is likely to cause a recession so Central Banks would avoid it. Will the Monetary Authorities ever Increase Interest Rates when Inflation is Low? They want to encourage saving as opposed to inflation. There can also be a circumstance when a Central Bank keep interest rates very low, despite an increase in inflation. For example, in 2011, UK inflation reached over 5%, but the Bank of England kept interest rates at 0.5%. The reason for this was. Despite the increase in inflation, the Bank of England was also concerned about the threat of the economy sliding into recession. Therefore, they wanted to keep inflation low to boost spending and demand. IS LOW INFLATION AND DEFLATION THE SAME??? Deflation is when inflation rate becomes negative or is below 0. If inflation is negative i.e. deflatiion then why the rates of every thing is increasing?? if its so bad lets boycot every thing then. but thats just me im all about anarky.